We are delighted to announce the launch of our New Brand Identity and Strategic Plan! 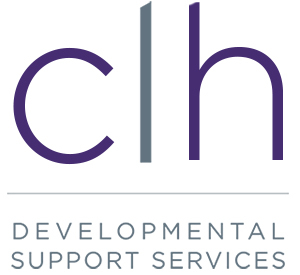 CLH Developmental Support Services is a multi service agency that provides specialized services to children, youth and adults who have developmental support needs. 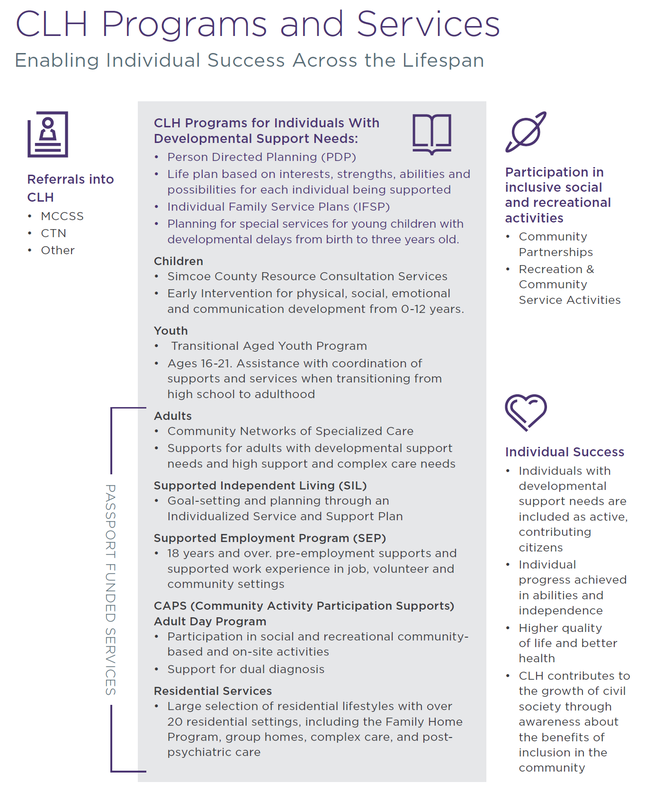 CLH Developmental Support Services (CLH DSS) supports over 2000 people across all ages. We employ over 300 staff and engage over 120 volunteers, working together to facilitate acceptance, inclusion and support of people with developmental support needs. Our determination to serve and our spirit of equality remain the foundation of our work today. Staff, volunteers, families and the individuals we support all make valued contributions to our organization, collectively working to achieve our shared goals. All people will live with dignity and respect, share in every element of living and participate as valued members of the community. CLH DSS is a partnership of caring people working together to provide specialized services to children, youth and adults who have developmental support needs. We create an environment of acceptance, encouragement, and life-long learning, together with our network of dedicated community partners. CLH began in 1960, when a group of parents of children with intellectual disabilities, organized by Evelyn Banks, formed to advocate for educational opportunities in the public-school system. In September 1960, the first eight local children attended segregated classes at Regent Public School. The “Huronia Association” grew out of this movement, which was known over time by several different names. In the Spring of 1966, the organization was incorporated as the Huronia Society for the Mentally Retarded. In 1977, the Huronia Society for the Mentally Retarded changed its name to Huronia Association for the Mentally Retarded (H.A.M.R.). Four years later, the Board of Directors adopted a new name – the Central Administration for Community Living Huronia (CLH). By 1998, the CLH Foundation was also established and registered as a charitable organization. The CLH Foundation remains an important CLH partner, leading in fund raising and providing critical capital resources. The 2018 strategic planning process identified concern with the current CLH brand and visual imagery. It was agreed by the CLH leadership team, the CLH Board of Directors and the Foundation Board of Directors that a re-branding exercise be undertaken. The CLH DSS Strategic Plan 2019-2021 established a clear brand renewal directive – CLH DSS will have a strong, progressive and recognized brand that grows awareness of the agency across all communities in Simcoe Region and beyond. Over the next three years, significant effort will be made to ensure that CLH DSS is well known and maintains its excellent reputation across Simcoe County and with all levels of government. We will share our great CLH DSS story with community partners, with the general community, and especially with young families and transitional aged youth. CLH DSS will deploy a new marketing strategy that will clearly demonstrate that our social service agency is helping to build civil communities, is delivering highly relevant programs, and is having positive impact on the lives of individuals who have developmental support needs. CLH Developmental Support Services is now launching our new Leading the Way Strategic Plan and our organizational rebranding program. The CLH DSS SuccessMap™ Leading the Way Strategic Plan 2019-2021 outlines our new path forward and recognizes the important role that our agency plays in Simcoe County and across Ontario. This new Strategic Plan will ensure a progressive approach to inclusion that brings measurable social impact to the people with developmental support needs. Our Strategic Plan will also enable our continuing contribution in building civil society in Simcoe Region. In partnership with the local community, we build innovative approaches to improving quality of life, by supporting and empowering children, youth and adults with developmental support needs. Our strong record of safety and high-quality programs has developed confidence in CLH DSS, enabling our continued expansion into a broad range of services and supports. Over the next three years, we will continue to be a community leader and role model. Our long history of caring, compassion and active community engagement has provided life-changing opportunities for thousands of individuals with developmental support needs. Our network of care continues to grow across Simcoe County, with remote services now being provided across the Province. CLH DSS has demonstrated leadership in service delivery, and especially in the ability to find novel solutions to support individuals with complex needs. We will continue to respond to increasing needs and grow meaningful opportunities for individuals with developmental support needs. To enable our success, we will actively engage in partnerships with over 63 community organizations. A sincere thank you to our Board of Directors, our staff, our families, our partners and our stakeholders who made a valuable contribution in the creation of this new SuccessMap™ Leading the Way Strategic Plan 2019-2021. CLH DSS believes that all people who are in need of developmental support services should have the opportunity for self-directed positive experiences, education and meaningful opportunities in the community. To date, CLH has impacted the lives of many people in Simcoe County and beyond.